Concho Belts are among the most striking pieces of Native American Indian jewelry. Each individual piece has been skillfully hand crafted by Native American jewelry artists / silversmiths to bring out the natural beauty in the precious metals and stones. Concho Belts are almost always made of sterling silver with detailed hand-stamped designs, and often have set or inlaid stones of Turquoise, Lapis, Coral, etc. Although concho belts are typically associated with Navajo jewelry, we at Two Grey Hills Indian Arts & Jewelry occasionally carry Zuni concho belts or Hopi concho belts as well. Concho Belts are most often stylishly large and worn over pants or a dress, but occasionally are small enough to be worn through the belt loops. Equally appropriate for men’s or women’s attire, these belts are an opportunity for each silversmith to memorialize their creativity, ability, and artistic expression. Beautifully and skillfully handcrafted, these works are wearable Native American Indian Art masterpieces. ‘Concho Belt’ (sometimes called ‘Concha Belt’) refers to a belt of conchos (or conchas). The word concho comes from the Spanish word “concha”, meaning “conch” or “seashell” or just “shell”, but has come to more commonly mean oval, round, or occasionally rectangular discs of silver used to adorn belts, for jewelry such as pendants or bolo ties, and to decorate saddles and horse bridles. 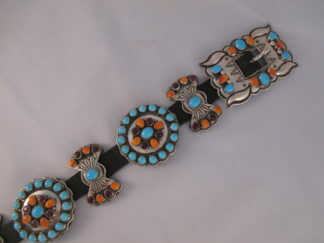 Concho belts are a long-time Navajo tradition, yet it is widely believed that the Navajo jewelry artists and silversmiths borrowed the design elements of conchos from Mexican horse bridles or from the hair ornaments of the Plains Indians (both of which likely originally came from the Spanish). However they originated, through adaptation and artistic exploration, concho belts are now uniquely a Native American art form and exemplify the Southwestern look. The earliest conchos were hammered flat from mostly Mexican or US silver coins, then hand-stamped and edged, then strung together onto a piece of leather through slots in the conchos to create the concho belt. Later in the evolution of concho belts, copper loops were soldered to the back of the conchos so that the conchos could be slipped onto leather belts. By the early 1900’s, buckles were added along with ‘butterfly’ spacers, and turquoise stones were set onto the conchos, buckles, and butterflies. Because the earliest conchos were mostly fashioned from silver coins hammered into thin discs (conchos), it is theorized that these early form concho belts were symbols of wealth. The wearer was literally wearing their money on a belt!! Also, concho belts have reportedly served important ceremonial purposes at different times. This is evidenced by the widespread use of Turquoise, recognized for its healing properties, in sterling silver cocho belts. There are two general types of concho belts: leather and link. The leather belt portion of leather concho belts is usually extra long with no punched holes, so that you can custom fit the belt to your size. The conchos can usually slide along the leather so you can position them to fit your own waist size. Or you can remove conchos and find alternate uses for them (for example, slide two or four conchos onto a different favorite belt of your own. 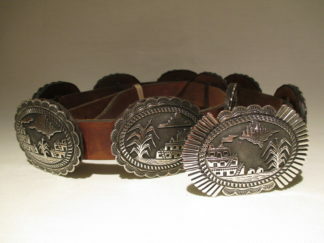 — Link concho belts (also almost always sterling silver) are conchos that are connected by rings. Link Concho Belts fasten with a hook that can be attached almost anywhere on the belt, usually between any link. This makes link concho belts versatile, adaptable, and able to fit almost anyone. Those with smaller waists will have a larger portion of the belt hanging down after fastening. We only sell authentic Native American concho belts, hand-made by Navajo, Hopi, or Zuni Indian jewelry artists & craftsmen. An authentic concho belt is among the most recognizable and striking pieces of Native American Indian Jewelry, and a true symbol of the great American Southwest. An authentic handcrafted Native American sterling silver and turquoise concho belt can be an impressive accessory for anyone. This is wearable artwork. We hope that you can find a concho belt that suits you perfectly!